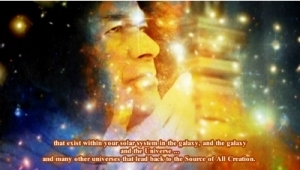 Valerie: We are calling on Cosmic Sai Baba to make His presence amongst us, this day. And we welcome Him with love in our hearts. It is the 2nd of February 2016, and we are meeting in Moss Vale, Australia. ❝I am here, and I am very pleased to be here. I really enjoy coming to speak with those that I know welcome me and accept me. For I come with a message of Love. Of Love … … and Unity and Kindness and humility and caring for people. This is the Love that exists in the Universe of all Creation. The energy infiltrates everybody – if they will allow it. Every child that is born on this Earth is born with this energy. So there is no such thing as an evil child – far from it – however some grow and do what people call evil acts. But they have forgotten, they have forgotten who they are – and there is always an opportunity to change their way of thinking or reacting. The True Frontier that needs to be researched, is the one inside one’s being. The inner frontier of who you really are. And it is possible to find many ways to do this. I would encourage you to do research – and take note that of things that come around you – to prompt you – to research – or investigate – things that are happening within you. For it is your emotional reactions that will give you a clue as to what you need to look at and perhaps change within yourself. You are the mirror – and if people want to change and find out what ails them, they can ask. That is all they have to do. You ask God or the energy from the Source to help them to find the way, to know the way, and to understand the way. And from there – energies that are no longer needed within them can be released and replaced with the energy of love. Which I have already said, is one of kindness and assistance to others. Now having said this you have this language that is within you – a language of Light – it is vision – it is imagination – it is a nation of images. And if you sit quietly, and work with that, you can help bring changes upon this Earth and within yourself – by seeing the event or images changing to how you would like them to be. So focus on the Source of All Creation – that is all you have to do – and if you want to call it God – then please do. If you want to call it The Force – then please do. If you want to call it the Angelic Realms – there are beings that work very closely to that Source and they will assist you. So call on them to help you to change. To manifest the creation that is in your mind – it is possible. It is possible that you can create miracles if you want – if you believe – and you know, deep down, you can! So please pray, and use those images that you can see or feel or know – that can happen and be upon this Earth … as you know it should be. And how, deep within your hearts, you want it to be. Thank you my children for listening, and I know you will continue to work the way you do – to bring Peace and Harmony and Goodwill upon this Planet.